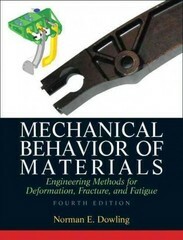 Mechanical Behavior of Materials 4 Edition For upper-level undergraduate engineering courses in Mechanical Behavior of Materials. Mechanical Behavior of Materials, 4/e introduces the spectrum of mechanical behavior of materials, emphasizing practical engineering methods for testing structural materials to obtain their properties, and predicting their strength and life when used for machines, vehicles, and structures. With its logical treatment and ready-to-use format, it is ideal for practicing engineers and upper-level undergraduates who have completed elementary mechanics of materials courses.